It’s another year, and yet another Call of Duty. If fatigue were to ever set in on such a series it probably should happen right about… a few years ago.Call of Duty Black Ops II is the eighth release this console generation, with Activision and partners churning out the first-person formula with differing studios back-to-back and year-on-year. Black Ops II is Treyarch’s sequel to the 2010 blockbuster Call of Duty: Black Ops, which was a great turning point for the studio, as their past ventures were by no means so fruitful. Have Treyarch yet again adhered to the call of duty, surpassing the benchmark they have set themselves, or is it all growing a bit too tiresome now? As expected, the core formula and gameplay remains for the most part unchanged and if sales figures are any indication, there’s certainly no cause for drastic changes to the CoD formula just yet. It’s very much Call of Duty, running on the same engine with the rock-solid frame rate, with expected action sequences – and more importantly comes with the high production values that such a budget can rein in. Still, proceedings are no doubt getting long in the tooth now, with that been there done that last several years feeling sinking in deep and hard. 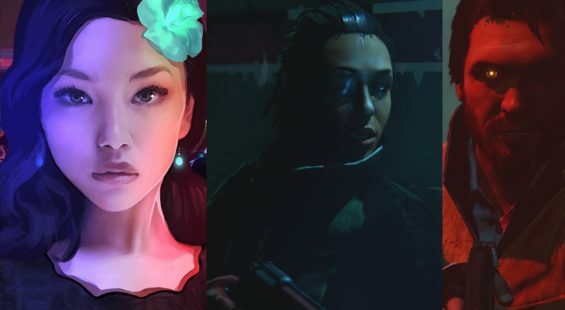 There are however some drastic changes buried beneath the familiarity, and they come into play where most expected, the single-player campaign. Black Ops II sends you back to the tried and tested Call of Duty stomping grounds of the past and shifts to and fro into 2025’s future which is the game’s present time-line. The original Black Ops trio are back, with Frank Woods taking centre stage as the anchor to the story, alongside Call of Duty’s most memorable villain yet, in the motivated and ruthless Raul Menendez. It’s in the past 1980’s scenarios that you fill the boots of the familiar gang that sets the tone of the story, and has you jumping into a future 2025, with all the perks, gadgets and gizmo’s that come with the futuristic territory, as well as playing as Alex Mason’s son, Special Forces own David Mason. While the story might not be as memorable as Treyarch’s first Black Ops outing, this sequel offers a great variety in the old familiar setting to the futuristic, with an interconnected story from past to future with old man Frank Woods wheeling out from his retirement home to chime in on proceedings before flashing back into the next classic-esque mission. It’s these cinematics combined with the actors impressionable voice-overs that drive the message home. The game just so happens to look pretty spectacular too, which for an ageing game engine is rather impressive – there are some instances where attention to detail is lacking, though where it matters most, it looks, and more importantly performs flawlessly. The weather in the futuristic 2025 with pouring down rain and lighting hits with much more dramatic effect, to the usual breeze of the sands of the past; still there’s new experience in the past as well as you’ll now be gunning down terrorists whilst riding and simultaneously having full control over your horse – that’s not as awkward as it surely must sound. The “numbers”, Reznov, and the general mind games of the original Black Ops made for something unique in the Call of Duty universe, while there have been some great games in the series past, it’s with Black Ops that I actually felt invested in the characters and had some sort of sense to all the mindless shooting and scripted action sequences, something that every other entry in the series failed to ignite as prominently. Those aspects are not really exploited within Black Ops II – the hook, line and sinker is really rooted on the storytelling by old man Woods, and the shifting time-lines; we are very much back on forgettable territory with characters and story, but the old vet and the strangely more favourable nemesis in Menendez provide just enough to keep proceedings going until the conclusion. There’s new types of missions too, known as Strike Force, these are interwoven into the single-player campaign. While the main story is based in the past and future, and is rather scripted, Strike Force lets you flex some of that futuristic muscle by instantaneously giving you freedom of swapping between soldiers, robotic gunner mechs, or take to the drone in the sky and go all tactical with the birds eye view. It’s not bad, it just feels random and unnecessarily dropped into the story; a different perspective is welcomed, but perhaps Strike Force may have served better in the co-op/multiplayer space. Strike Force has no immediate relevance to the unfolding story and as such merely proves a hindrance and distraction to the story itself. 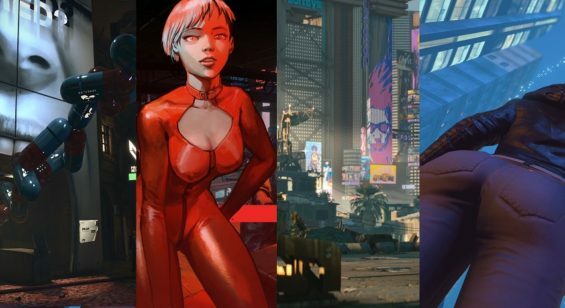 Besides the futuristic setting, Strike Force, though out of place, it can effect the outcome of the story as can some decisions during the actual story – it seems Call of Duty has gone a bit Mass Effect all of a sudden. It’s nothing too drastic, but is certainly a replay incentive to tag along with the usual Veteran difficulty playthrough and aim for a somewhat different path. The Zombie infection returns yet again to see if this third bite from the undead can prove ever so more delightful. The core survival premise has very much been expanded upon and evolved. It’s still a battle of survival in a fixed – sort of, space. The most notable change is the leap from 4-player co-op to 8-players for the Zombies mode. Delightful indeed, and that’s followed up with various undead modes to tailor the nightmarish survival experience. It’s still just that, all about survival but now with Tranzit, original Survival and competitive Grief modes. Tranzit is the more intriguing aspect and hacks the Zombies maps into one large play-space with a bus doing the rounds between the familiar locales, all of which otherwise act as single maps in the traditional modes. 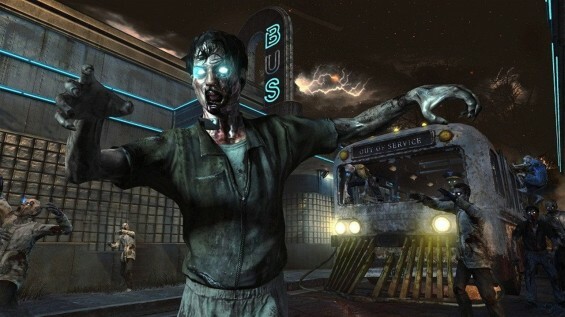 Grief brings forth the competitive aspect of multiplayer into Zombies, where it’s 4 vs. 4 vs. the horde of the undead. Needless to say there’s some hidden Easter eggs throughout yet again, and with further modes of play to experiment with Zombies has certainly become a much more fleshed-out experience. As for the multiplayer, well it’s fair to say that a good portion skip past the campaign and zombies entirely, and completely get absorbed in the multiplayer offerings. Black Ops II’s multiplayer offers up that familiar experience to sink your CoD stenched teeth into. As well as the familiar playlists and all new league, and further community options. Perhaps somewhat stand-out for some, is that there’s also incentive now for Achievements hunters to have a crack at the multiplayer whip. That’s certainly enough to entice me to get shot at online once again. 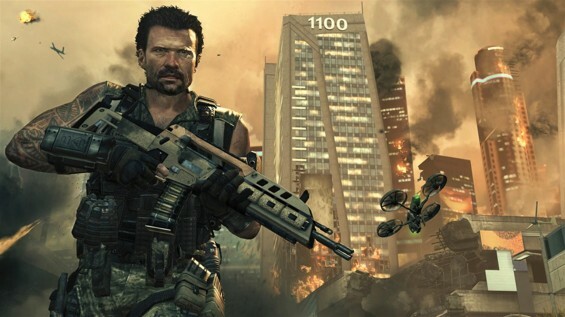 While it might not best their original turnaround title, this sequel still offers incredible value for money with an entertaining though at times flawed action-romp through familiar past and promisingly high-tech future, in combination with the staple Zombies and Multiplayer suite, Black Ops II is a package that is difficult to ignore. There’s some lows, and the expected action and scripted highs. The biggest problem is that it feels all too familiar, regardless of the attempts at direction change – the co-operative and multiplayer aspects will no doubt be enough to keep fans hooked until next year’s inevitable release.